Let’s Move! is celebrating its birthday. February 9th marked the 5th anniversary of First Lady Michelle Obama’s Let’s Move! initiative. This year, the theme is Celebrate, Challenge, Champion. This is a great time to honor the positive changes you have made by hosting a special event, celebration or posting pictures of your great work around your child care center or family child care home. 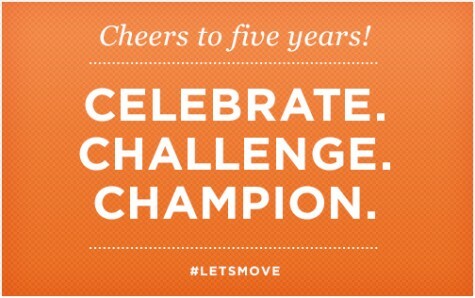 We would love to hear about any celebration you have to commemorate the 5th anniversary of Let’s Move! Submit a story and pictures of the celebration to LMCChelp@cdc.gov . Be sure to include your program name, city and state. Five years ago, First Lady Michelle Obama launched Let’s Move!, a nationwide initiative to set children on a path to a healthy future. Over that time, there have been commitments from all kinds of people to improve the health of our nation’s children. This resource is the new set of national standards describing evidence-based best practices in healthy eating, physical activity and screen time.